Welcome to the WhiteFire Publishing Scavenger Hunt! You’ve found stop #5, Debra E. Marvin’s website. If you’ve just discovered the hunt, be sure to go back to stop #1 and collect all the clues in order. Once you have them all, you’ll have uncovered a secret message. Turn that in at the final stop for a chance to win one of THREE amazing prize packages! Take your time! You have all weekend to complete the Hunt—entries will be counted until Monday June 26—so have fun reading all the posts along the way and getting to know each author! 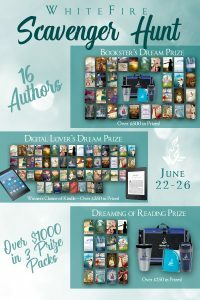 Many of the authors are featuring unique giveaways as well, for even more chances to win! EXTRA PRIZES! See mine below! When you’ve collected all the clues, submit your entry for the grand prizes back at Roseanna White’s blog. As travel companion to her condescending cousin, Philadelphian Kathryn Morton dreamily anticipates a week in the Wild West as the best cure for meekness. After a long rail journey and a steady diet of gothic dime novels, she shivers, despite the Texas heat, at the ghastly tales of the Austin Axe Murderer. Kathryn has little time to fret, given the competing attentions of quiet rancher Harmon Gray and elegant gentleman Jonathan Wellington. With her new-found confidence and her boundless imagination, she sets out to solve the mystery of Hyde Park Cemetery before another student flees Austen Abbey. Only then can she return home to her English-born parents as an independent American woman. A woman in love. But on the stormiest of nights, Kathryn learns that solving the mystery may destroy a future with the man she’s fallen for in a big Texas way. Before you go on to the next stop, #6, Dina Sleiman’s Website! , browse my prizes and the Rafflecopter form below! It took me longer to make that rafflecopter than it did to find the right title for my novella! And now, my giveaways! Look for all five in the Rafflecopter Form! 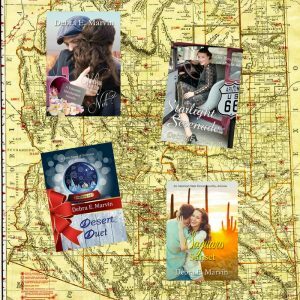 One Winner’s Choice of any of my four Ebook Novellas set in Arizona – Why Not? (Why Not is a title, not a comment by the way… Desert Duet, Starlight Serenade, Saguaro Sunset. Not sure which one? Visit my Amazon Author Page to decide! I’d hope you follow me there as well to learn about my new releases! 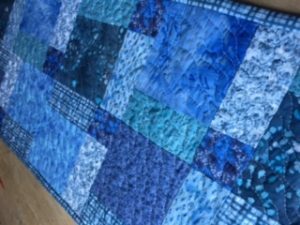 One Handmade Quilted Table Runner- (It’s the cure for the SummerTime Blues!) Makes a nice table runner or artsy topper for a dresser or hutch, at 11″x 33″. 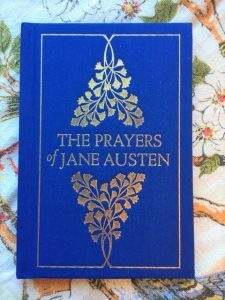 The Prayers of Jane Austen Gift Book. I am trying to fix the NO COMMENTS or CLOSED COMMENTS Problem but haven’t found a solution. My apologies. Thanks for the opportunity to win. You’re new to me, but I look forward to reading your work. outstanding prizes all around and it’s fun to visit the blogs! You are a new author to me! I haven’t read any of your books yet but, I will be! I see you around cyberspace, Beverly. I know you’re a reader. Authors are like that. ha ha! Thanks for commenting and being ‘on the hunt’! Thanks for the giveaways and the scavenger hunt! We had a blast writing this collection. All the authors are part of the Inkwell Inspirations blog! Thanks everyone! I had the worst time with blogger comments this morning and probably missed a few visitors. However, the rafflecopter works! It’s not enough to be a writer, you have to be a software and marketing expert these days! what fun! I have not read any of the Austen in Austin books. I would love the chance though. Hi Deana! thanks for commenting! Isn’t this a great promotion by WhiteFire? This is my first time hearing about the Austen in Austin collection. The collection came out in January of 2016, but just recently went to Kindle Unlimited. We have two volumes with four novellas in each, and they are all connected by setting and have returning characters. I hope you get a chance to read them! Debra, I have these two books on my very long TBR list. Thank you for a chance to win a copy. Debra, forgot to mention that Austen in Austin sounds like a wonderful book. Hi Tina! I’m glad to see you’re on the trail of great prizes. Thank you! Thanks, Susie! I love this quilt runner too. I will miss seeing it when it goes bye bye in the mail! Thank you for listening to me whine today. Your quilt is so beautiful. What a sweet giveaway! ha ha. we sure had a rough start this morning. Technology is not our friend. Authors should be writing but instead we are messing around with software, codes, html, and all that stuff. but TA DA! here we are! Look forward to reading your books! Thank you, Tammy! I do hope you can. I try to make lots of opportunities for readers to become reviewers. I’ve heard about the Austen in Austin collection. It sounds fascinating. It needs to go on my TBR list. This scavenger hunt is fun, and what some fun prizes. I love your quilt runner. Hope I get lucky. I enjoy meeting some new-to-me authors, too. I am just now learning about the Austen in Austin collection! thank you for stopping in, Janice! I think you’ll enjoy the collection. Two volumes, four novellas in each and they are all related due to a lot of work on the authors’ parts to tie them in together. We had a blast doing it. I hadn’t heard about the Austen in Austin collection until yesterday when I started the Scavenger Hunt, but it sounds fabulous. Love the title of your Alarmingly Charming book! Hi Kelly! I hope you’re enjoying the Scavenger Hunt. With all the prizes, I think our visitors have a good chance. WhiteFire is offering some amazing prize packages! I have to admit I LOVE that title, too. And it was perfect for my story and characters! The ‘suitor’ quote is from Alarmingly Charming. Thanks for the ego boost. I’m editing my next release and feeling as clever as a lamp post! Thank you so much for stopping in, commenting, and taking part in the ‘hunt’!! Have a great weekend, Joanne! Thanks for stopping in, Mark. Promotion is part of the reason WhiteFire is doing this great giveaway! A fun way to meet new authors and readers! This scavenger hunt is fun. Glad I discovered your work, it looks like some nice intriguing stories. LOL, A.S. McGowan, I believe we were interviewed on Rave Radio on the same day. Wonderful to see you here. Hugs, PS everyone, A.S. McGowan is also a wonderful writer. Thank you for commenting, and I’m glad you’re enjoying the event! I also like to blog hop just to see all the different ways we do author sites! They are a little window in the author’s world. Thanks for participating in the Scavenger Hunt and offering such great prizes. 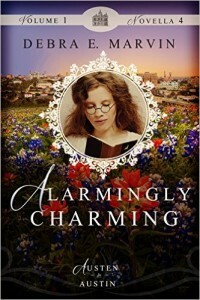 I have heard of Austen in Austin and I have Alarmingly Charming on my TBR list. Good luck with the Hunt everyone. I’m glad people are still reading this fun collection. It was my first contracted novella and a lot of fun to write! I’ve never heard of the series but it sounds great. I actually live in Arizona! Right now, most of my stories are set in Arizona, except for the Austen in Austin story (of course!) I have another one coming, that’s set in Bisbee and then I’ll likely put them in a boxed set of all Arizona stories. Thanks for commenting! I haven’t heard of these books before but now I can’t wait to read them! Thanks so much for the chance to win! Hi Megan! I’m glad you’re following the scavenger hunt and this proves it’s working. A fun way to see many of the WhiteFire releases and meet 16 of the authors. Thank you for commenting! Thanks Amanda. 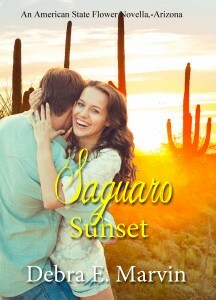 Saguaro Sunset is my first published contemporary so I didn’t know what to expect when I sat down and wrote it. I’m really a historical writer at heart, but it’s good to ‘stretch’ and try different genres and settings. I have a mystery coming out soon, as well. Hi Debra, your prizes look enticing – glad to be connected w/you through WhiteFire. Do you live in Arizona, perchance? I pieced together four table runners in the winter and I’m glad I did as I’ve been too busy to start from scratch. So I had a nice one ready to go and I just had to quilt it (on the machine) to get it ready, plus the hand stitched border. And they can be washed if needed. I have heard of Austen in Austin. It looks really good! Thanks! Hi Paula! I’m glad you’ve heard of it. 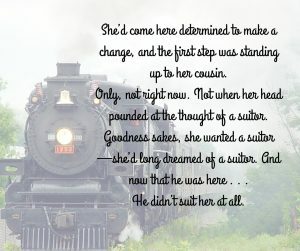 There’s also a new novel out called Jane of Austin! but when we thought of a title, we HAD to go with Austen in Austin for the collection. I hope you get a chance to read it. 3.99 on kindle or free on Kindle Unlimited now. What an amazing giveaway, Debra! That table runner is so beautiful!! Hi Joy! I hope you’re enjoying all of your visitors, too! Thank you for the compliment. It’s very pretty in person so I’m glad the colors came through with the natural light. I love these scavenger hunts! To answer the question in the rafflecopter I have not heard of the Austen in Austin collection until now. I’m interested in it now. There are some outstanding novels and a non-fiction story or two from WhiteFire, so I’m very happy that the scavenger hunt will bring some more recognition of what they’ve published. Debra, I loved Volume 1 in this series! I haven’t read them, but I’ve heard great things about the books. Someday I hope to read these books and see what they’re all about. Thank you for visiting, Stephanie! I appreciate your kind words! I was just thinking how much I enjoyed Suzie Johnson’s Sweet Mountain Music, another great WhiteFire release. I haven’t heard of this collection, but the title alone is enough to make me go check it out!! I wish I could share all the fun we had coming up with this collection. We called it Austen in Austin from the start, and were pleased that WhiteFire loved it enough to keep it. Your books sound very interesting. I will definitely have to check them out. Thank you Roma! I appreciate it. I seem to have quite a variety here as it’s been fun to be part of various collections from WhiteFire and Forget Me Not. My first love in fiction is actually mystery, so I’ve incorporated it lightly into a couple novellas. Alarmingly Charming was a challenge as I had to keep with the Northanger Abbey feeling, so I have a mini-mystery inside those 20k words! I do hope you can, Becca. I think you’ll be entertained by the stories and how they fit together in the Austen in Austin collection! oops, my reply popped down below. Sorry. Thanks Jeanna! i haven’t heard of Austen in Austin, would love to read it! Thank you Jeanna! 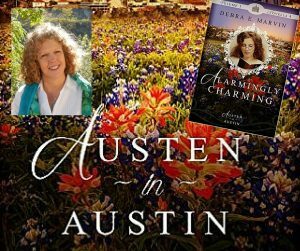 The 8 authors of Austen in Austin worked hard to tie in characters and setting details. I jumped in to Austin’s history and learned a lot about the setting. Austin has a great collection of old postcards and photos online. I love being able to see Congress Avenue and the capital building (or is that capitol? ha ha) over the many decades of the post cards. And it was my first time writing about BUSTLES!!! Thank you for commenting, Keilah. Now that you know about it, I hope it intrigues you enough to purchase… OR… maybe you’ll win it! Thanks for the fantastic giveaways! Yes, I have heard of this book. This is the first time I have heard of this series. I will check out Amazon. Thanks for stopping in and finding out about A in A! I wish you the best with all the prizes, Sonnetta! I have heard of the Austen in Austen series but haven’t had the blessing of reading them yet. Thanks for the giveaway opportunities, Debra!! Thanks so much Bonnie! I hope you get a chance to read them. We have two volumes, four novellas in each and they are chronological. I own and have read Austen in Austin. Great collection!!! YAY!!! thanks for commenting and I’m thrilled you’ve read the stories! Have a great week, Becky!